30% charge of total fee within 4-8 weeks prior to commencement of booking. 50% charge of total fee within 2-4 weeks prior to commencement of booking. 75% charge of total fee within 7-13 days prior to commencement of booking. 100% charge of total fee for non-arrival and up to 7 days prior to commencement of booking. Admin fee of £25 will be incurred for any cancelation. All bookings are accepted on the understanding that any regulations made by Greenwich Leisure Limited (building operators) for the safety or convenience of those using facilities, wil be observed and no liability whatsoever shall attach to Greenwich Leisure Limited or their servants or agents for any damage, loss or injury howsoever incurred. Any groups where there are children under the age of 16 must have a ratio of 1 responsible adult over the age of 18 to every 20 under 16 year old. Residents will have access to their rooms from 2.00pm Monday-Saturday and 3.00pm Sunday on the day of arrival unless otherwise agreed. On the morning of departure residents must vacate rooms by 9.30am Monday-Saturday and 10.00am Sunday unless otherwise agreed. Please note that luggage can be stored at the risk of of residents only. Any breakages or damage to property will be charged to the lead party member at a reasonable cost of repair / replacement. Sports facilities can be booked as part of any group booking. Please contact centre staff directly to discuss this further. The iconic, world famous Crystal Palace National Sports Centre was opened in 1964 and today is a listed heritage building. 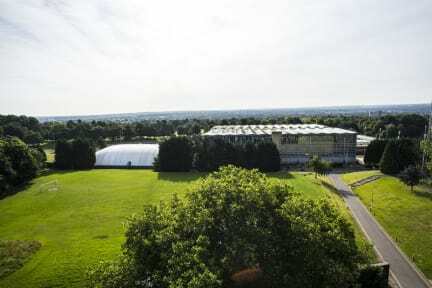 Set within 200 acres of parkland, the facility provides a unique London venue steeped in sporting tradition. The Lodge provides excellent value for money with options of single, twin and triple rooms. With 87 rooms across 10 floors with views over Crystal Palace Park and South London. Continental breakfast is included with all bookings and dependant on other bookings residents have the option of lunch and dinner at an extra cost. With its world class sporting facilities the on site accommodation is ideal for sports training camps and can cater for upto 144 athletes, coaches and support staff. 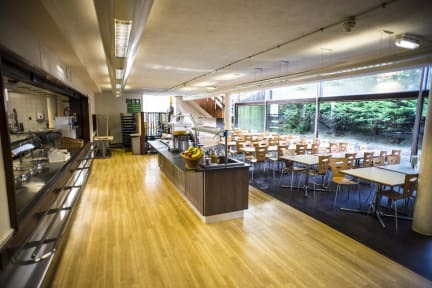 The National Sports Centre is operated by GLL, Leisure's most successful social enterprise, managing over 100 sports and leisure facilities across London. Visit www.gll.org for more information. Fancy running on the same athletics track graced by the likes of Usain Bolt or Tyson Gay? Or swim in an International FINA accredited 50m Racing Pool? With the National Sports Centre itself just a short walk away there is the opportunity to make use of international sports facilities and take part in a wide variety of activities such as racquet sports, climbing, or football on offer at an additional cost. Our guests can take advantage of some of these first class sports facilities for just 10 per day. This allows access to our state of the art 100 station fitness centre, a public swim session and use of the athletics track. We are also proud to be a member of www.payasugym.com which would enable visitors discounted access to the Fitness Centre. The Lodge is a short walk into Crystal Palace itself which has a host of bars, restaurants and shops to entertain our residents. Crystal Palace Football Club are a 10 minute bus ride away where during the regular season games take place every other weekend. The park itself has a lake and dinosaur trail as well as The Crystal Palace Museum and maze. The Horniman Museum is also just a short bus ride away from the Lodge in Forest Hill. Central London is 25 minutes by train for London Victoria or London Bridge. Residents will have access to their rooms from 2.00pm on the day of arrival unless otherwise agreed.